Doing what I love, loving what I do. No more, no less. An international organization and environment where people are open for the unique and unprecedented opportunities of the digital transformation, also known as the Industrial Revolution 4.0. It is a place where you can explore, discover and share new practices of business, leadership and client relationships. A work-life balance doesn’t exist only on paper but is lived, day in day out. Simply because people love what they do and do what they love. It is a balance between work and life; not in the sense that work is bad and life is good, but because both are positive and inspiring. My own role is right in the middle of this environment. Helping people and organizations unfold their potential, growing ideas into concrete business results that delight customers, contributing to a happy workplace, and ensuring and sustaining business value through continuous self-improvement. It is role that mixes practices of empowerment, facilitating, training, consulting, managing, learning and sharing. So, where, you might ask, is this place, this work? – As mentioned above, this is my dream, this is my vision, this is what I am driving for. It could be an existing company already practicing mindful leadership and nurturing a healthy, lively and agile community. Or it could be an organization or company that is realizing that traditional management practices of the 20th century no longer provides the answers to today’s challenges and therefore open up for modern human, holistic and mindful approaches to leadership and business in the Creative Economy. Those are organizations and companies that are or will become the masters of the digital transformation. Those are the employers of choice because they make a difference, serve the community and leave a positive dent in the universe. 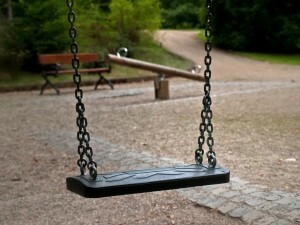 This is the place where I want to be and contribute to. Illusion, phantasy? Or, can you pinpoint or recommend any organizations that are on the path described above and are looking for support? If so, please share. You love projects. You love good project management. And you love the exhilaration of power teams and project success. BUT you are struck in a matrix? Not the matrix of the movie. But the matrix of a strong line organization where projects have all but a miserable existence. The line organization is dominating, politics is prevalent, people care more about securing their own posts, maintaining the status quo and thus focus on their daily tasks, not willing to look outside their box or even beyond their own desk. Projects?! Gee, hell no! Those are activities where you have to work with people from other departments, maybe even in cross-functional teams. But, what do those folks know about my area of expertise. Nothing! Hence, it is better to keep things as they are. Does this sound familiar? Or, have you ever experienced or heard of such an organization and setting? – If so, continue reading. On Thursday, 2 October 2014 from 11:30 AM – 1 PM EST I gave a free webinar for the IT Metrics and Productivity Institute. The webinar is entitled “Surviving in a Matrix: Simple Techniques for Effective Project Management in a Matrix Organization”. In this webinar I introduce a simple, yet very pragmatic approach to structure, plan and set-up a project in a matrix organization with strong line management and a weak project culture. I explain the need and value for developing a compelling project motivation, vision and objectives. I outline how to engage stakeholders in building a work package structure, outlining a project organization, implementing an early warning system for plan deviations, establishing risk analysis and management. Last but not least, I elaborate on how to cultivate continuous learning in a matrix organization. Don’t stay stuck in your matrix. Learn how to survive in your matrix, introduce effective project management techniques and become a master of your own project success. 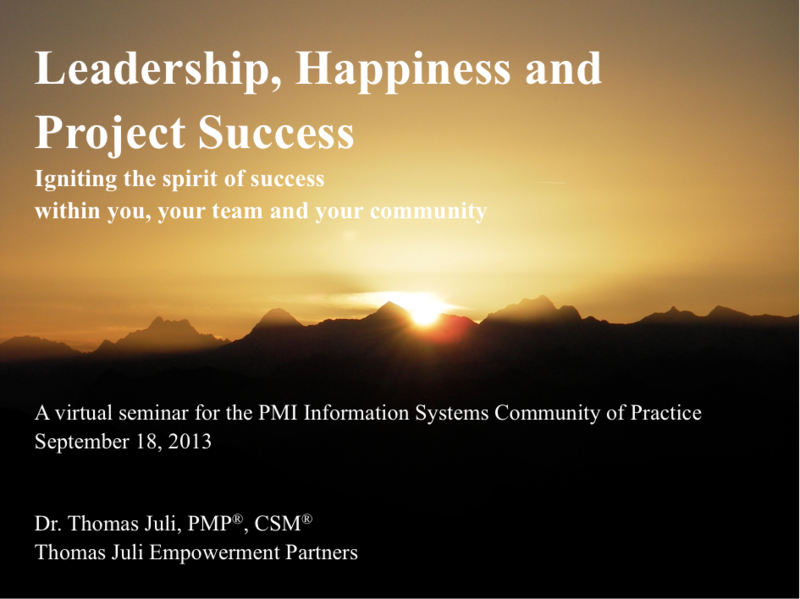 In this webinar I am exploring two crucial ingredients for project success: empowering leadership and happiness. 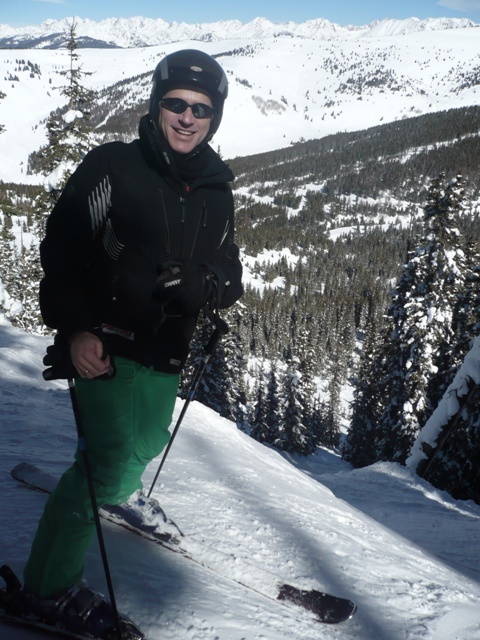 I explains why and how leadership can help build successful projects by actively accounting for happiness on the individual, group, project and organizational levels. Attendees will learn how to find a clear focus of what they really want to achieve, create a strategy through principle centered leadership, resolve project issues and align their priorities for happiness and project success. The presentation targets anyone who is sincerely interested in finding new and transforming ways to project success. These can be individuals, project managers, project team members, line managers, line organizations, companies or social groups. 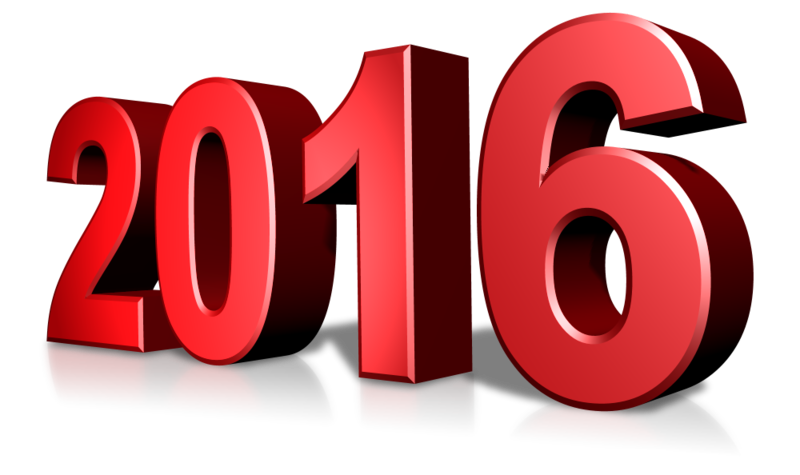 Registration is free for active PMI members. If you are not a PMI member and still want to view the presentation, have a look at my handout on Slideshare. Or, if you like to receive a pdf version of the presentation, please contact me directly. 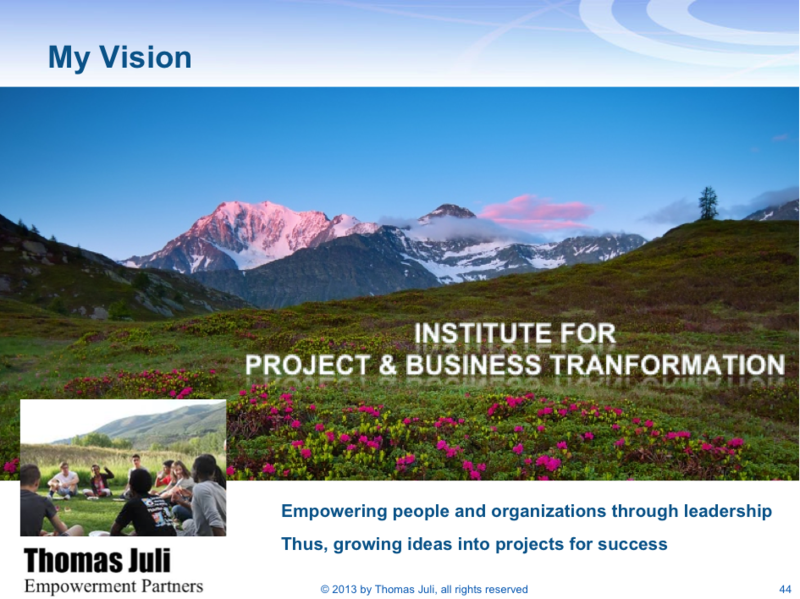 In my webinar I am talking about my personal vision of helping build an Institute for Project and Business Transformation. This cannot be done by oneself. Instead, it takes the effort of like-minded people and a strong, performing team. On this token I want to invite you to join this great effort. Stay tuned for updates on this new and exciting project. I conducted a project leadership for members of a trainee program. Attendees were motivated and full of energy. Participation was very good and some of the insights and outcomes of the interactive exercises were even astounding. Then, toward the end, the bubble of excitement bursted when one of the attendees asked for more detailed instructions how to apply “my” 5 leadership principles for project success. “Eh, what! ?” I thought. “Have I missed anything? Didn’t we just go through a number of exercises that addressed the very same question?” – What went wrong? What went wrong was that I mistakenly assumed that the trainees to think on their own, to leave their old perceptions behind at least for a few moments and to walk on their own. Sorry, this was a mistake. What I didn’t understand or at least forgot that students these days have been drilled to memorize whatever the teacher gives them. The less they challenge the material, the better. For it is more important to get a good grade and pass. This is legitimate and it works for the grand majority of people. However, if you want to train leaders it is a dead end. You have to take (most) students back to when they were little kids asking the annoying “WHY?” question over and over again. And – you have to encourage these leadership trainees to go ahead and ask the WHY? question on a daily basis. Even if they face obstacles, opposition and rejection. If they don’t have the guts and maybe even don’t see the necessity to take these steps, they should not claim to learn something about leadership. They may become decent managers but probably never reach the level of leadership. On this token, can trainee programs teach leadership? – Yes, if they start teaching their trainees the necessity and value of asking WHY? and to start walking on their own. – Luckily, they do exist. – If instead trainee programs focus on technical and old-school management skills, forget it. Following up some of the questions in my last webinar on March 6 I want to explain what distinguishes a self-organizing team from a manager-led and self-governing team. Manager-led teams are defined and led by someone from the outside. A manager appoints a project manager and the project manager becomes the boss of a team. The team reports to the project manager; the project manager to the project sponsor or another manager. The team does whatever the manager tells it to do. It is an extension of a linear hierarchy we still can witness in many organizations these days. In contrast to manager-led teams are self-governing teams. These teams do not have exposed leaders at all. Indeed there is not even an outside manager. Teams are self-selected in the sense that team members have found each other and work on something their teams decide. The directions of such teams come from the teams themselves. A mob may serve as a good example. 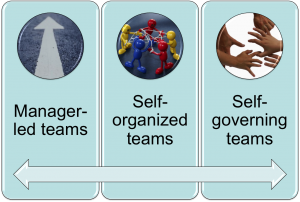 Self-organizing teams are somewhere between manager-led and self-governing teams. While the overall direction of the work of self-organizing teams may be defined from the outside, self-organizing teams decide by themselves how to execute these tasks, manage processes and monitor progress. Self-organizing teams design their own activities that cumulate in final project deliveries. Dinesh K: How do you rate productivity of different team (managed vs. self-organized vs. self-governed team)? Productivity can be high in either team. However, it is most likely that self-organizing teams have a greater productivity in the long haul. Thomas D.: Do Managed Teams use teamwork? Yes, they can. However, don’t necessarily expect team magic, i.e., team synergy effects, to evolve. Often a “team” which is manager led is more like a group of indviduals. In case the manager empowers the team, true teamwork can evolve.